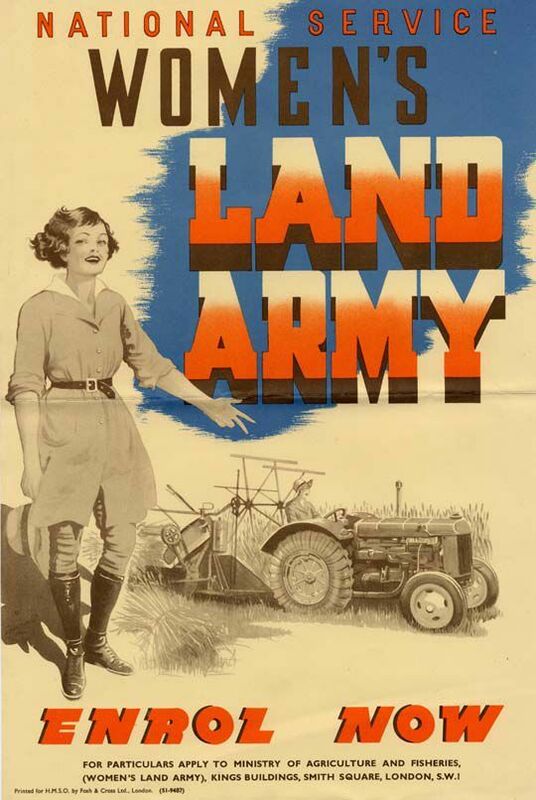 The Women’s Land Army (WLA) was formed in 1917, during the First World War, when food shortages meant that the government had to fix prices and eventually introduce rationing. As merchant ships were being attacked, it was harder and harder to import food to Britain. To help boost food production, ‘Land Girls’ were sent out to farms as extra workers. A large number came from rural areas and knew what the work would be like, but many of those from towns and cities had a shock in store. Life in the Land Army was very different from the recruitment posters. Land Girls found themselves driving tractors, catching rats, milking cows and harvesting crops. The work was hard, a 50-hour week, involving long days outdoors in all weathers, and the risk of injury. 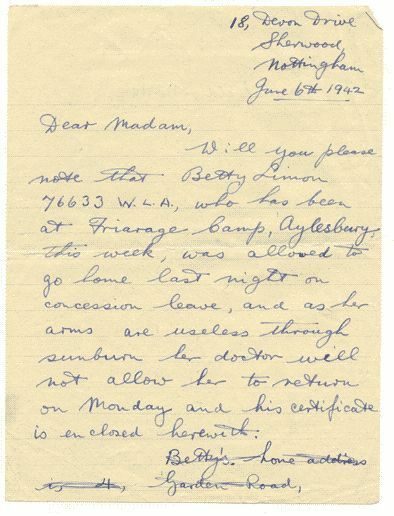 The letter below, reports that Betty Simon, a Land Girl working in Nottingham, had to return home on sick leave in 1942, as ‘her arms are useless through sun burn’. Despite the hardship, many Land Girls enjoyed their work and felt that they were helping the war effort. In 2008 their achievements were finally recognised when the government awarded a special badge to surviving Land Girls and Lumber Jills. Known as ‘Lumber Jills’, from 1942 members of the Women’s Timber Corps worked in forestry. They felled trees, measured logs, lugged timber on to trucks, and then drove it to the saw mills. One former Lumber Jill, Edna Holland, was just 17 when she went to work in a Lumber Jill camp in Boltby, on the North Yorkshire Moors. Her days started at 7.30am and finished around 5pm and at the weekends she enjoyed going to dances. She didn’t think much of the uniform of ‘shoes, boots, jodhpurs, dungarees, two shirts, a green jumper, coat and beret. The dungarees did not stay like that for long as we cut them off into shorts’. Edna found her work hard but rewarding: ‘we learnt such a lot. We started off by learning to fell a tree. Then we were taught how to measure different sized pit props. My goodness we got muscles everywhere, but it made us feel really good. (Quotes sourced from a Guardian article). Interviewer: Why did you want to leave the Ministry of Food and go into the Timber Corps? Interviewer: You’ve said that the Timber Corps were, kind of really, the unsung heroines, if you like, of the Land Army. BG: Oh, we kept the timber, furniture industry going and also the ships at sea because certain timbers that came in were made to go on motor torpedo boats and motor launches and gun boats, which they needed when they’d been blown up, they needed replacements. So the timber was there because we couldn’t import it due to the, you know, the ships being torpedoed. 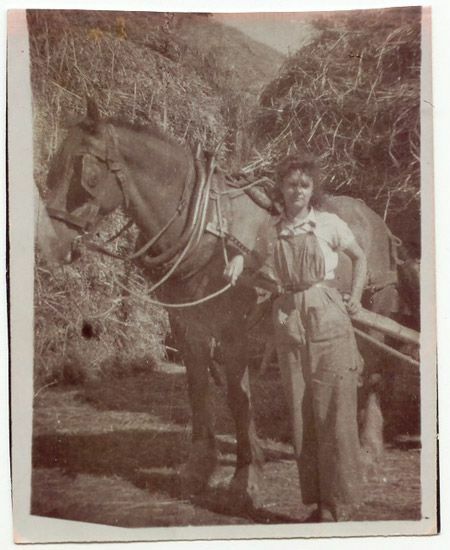 Do you think war work on the land turned out to be as exciting as young women like Brenda Gibson hoped? Why do you think women had for choosing outdoor work? What sort of risks do you think these women took? Why do you think there were food shortages in WW2? - How did she feel about her role with the Timber Corps? - Was she happy to help with the War Effort? - What do you think the role meant to Brenda? Compare sources: Look carefully at the photograph above of the land girl holding a horse and compare it to the Land Army recruitment poster. - How do the two women in the pictures differ? - From what you know about the WLA and the sort of work women did, do you think the poster shows an accurate picture of their lives? - Why might the poster present the WLA in a certain way?